The want of elementary books in Bengali and Hindustani languages had for some time been experienced at Fort William College. An establishment of an independent Institution to take charge of such business was being considered in the light of existing trend of thoughts. Presumably, some enthusiast within the circle of Fort William College, like a David Hare, might have actually initiated the idea and helped in forming an association for careful inquiry and deliberation on the subject. That the Society was to furnish books of school instructions in English and Asiatic languages; and more. The Society gained its importance on two grounds: Preparation of School Books, and Procurement of School Books. 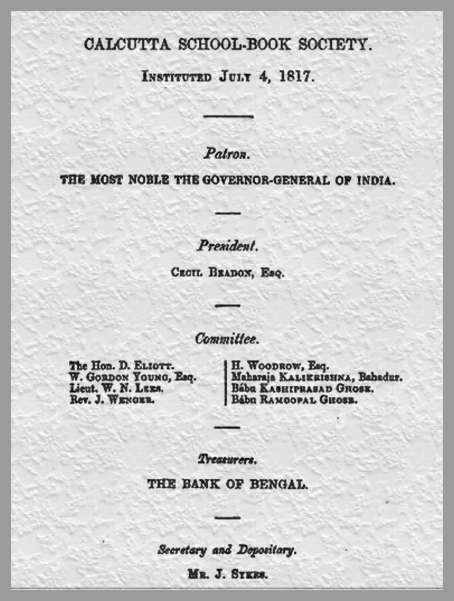 “The elementary Class-Books in English which are used in the Government Schools were for the most part compiled under the direction of the Calcutta School Book Society. They consist of a series of English Headers, and of Treatises on Arithmetic, Geography and History. It does not appear that any difficulty whatever was experienced by the Society in procuring books. 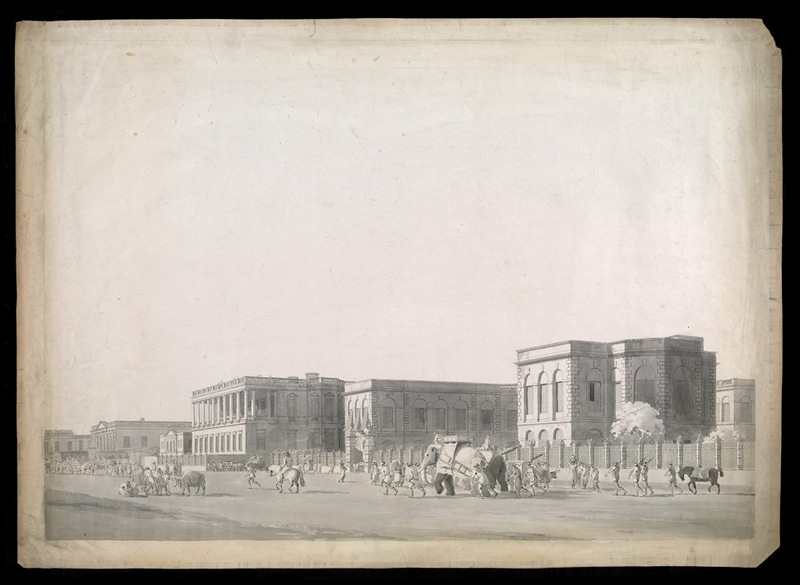 The Branch Depositories of the Calcutta School Book Society in every part of the country supplied all the ordinary Class-Books; and such other books as were required could easily be procured in Calcutta or direct from England”. Much later, the Calcutta School-Book Society and the Vernacular Literature Society was amalgamated on the 22nd April. The stock of books of the Vernacular Literature Society was taken over next October. The current address of the Society was no.9 Government Place East. The Society’s Depository was removed from Lower Circular Road to 12 Lal Bazar next month. 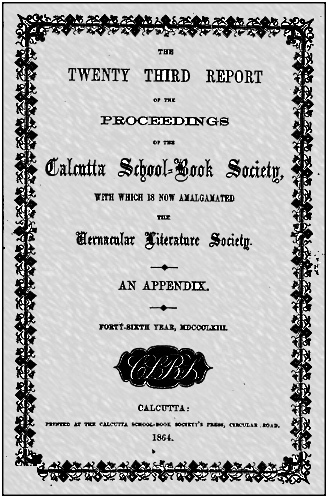 As it was amply verified, by the old records and reviews available today, that the Calcutta School-Book-Society admirably served the purpose for which it was started. 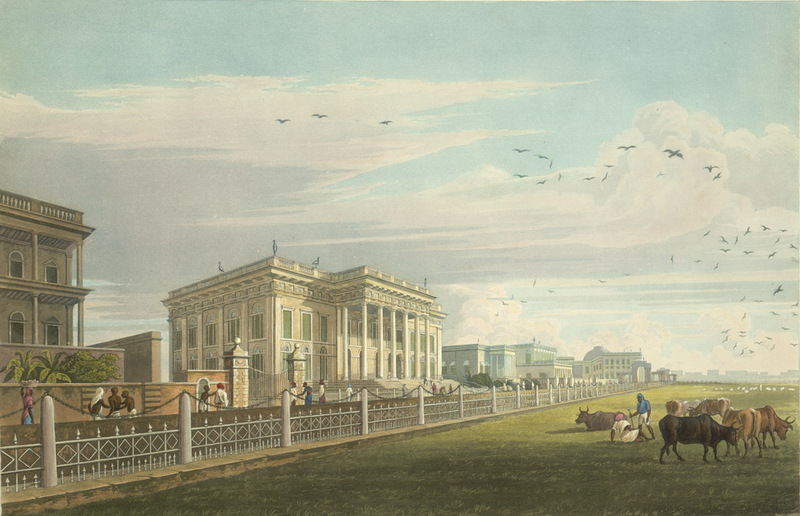 The above colored acquaint painted by James Baillie Fraser in 1826 depicts the Town Hall of Calcutta, erected in 1813, where most of the meetings of the Calcutta School-Book Society took place. Adjoining Government House to the west stood the Council House. After the recovery of Calcutta there was no Council Room for a twelve month to carry out business of the settlement. The dwelling house of the late Richard Court was purchased for the Honble. Company in 1758 and appropriated to the above use. .. It was probably a house near the hospital, and remained in use till 1764, when the Council House on the Esplanade was built, and gave its name to the street. Contiguous to it a house for the Governor was built. These two buildings continued in use till 1799, when Marquis Wellesley built the present Government House, on the site they had occupied.